Heat the oven to 160°C/140°C fan/gas 3. Cut the baguette diagonally into thin slices and arrange on a baking sheet. Drizzle with olive oil and bake for 10-12 minutes until crisp. Set aside to cool (see Make Ahead). Put the beans, tahini, lemon zest and half the juice in a food processor. Pulse briefly while drizzling in the 50ml olive oil to give a chunky purée. Add salt and pepper, along with more lemon juice if needed (see Make Ahead). For the salsa: chop the parsley, anchovies and capers, transfer to a bowl and add the garlic, lemon zest and juice. Add the olive oil to cover. Stir well and season with salt, pepper and more lemon juice if needed. 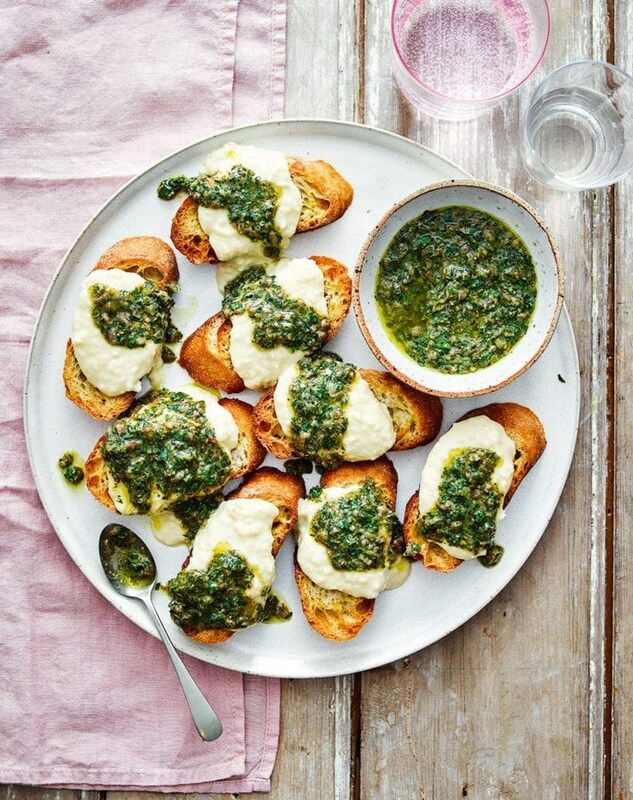 Dollop the bean purée onto the crostini and drizzle generously with anchovy salsa to serve. Make the toasts and whizz the cannellini beans a day in advance. Keep the beans covered in the fridge and the toasts in an airtight container.